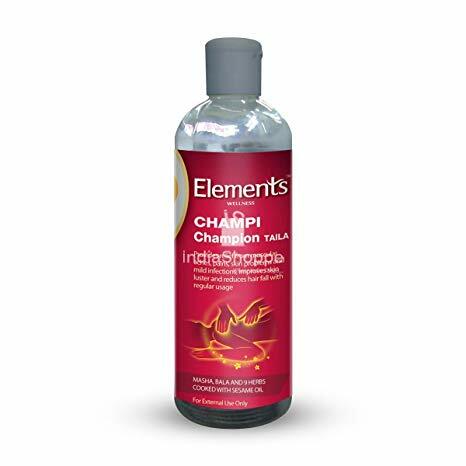 ELEMENTS CHAMPI CHAMPION TAIL Product Descrip | INTELLECT WELLNESS CHEMIST PVT. LTD. ELEMENTS CHAMPI CHAMPION TAIL Product Description Elements Champi Champion Tailam 200Ml Elements Champi Champion Taila offers a unique rejuvenation process of massage of the body and its parts after application of medicated oils. The oil is processed by slowly boiling sesame oil with added herbs such as Masha and other ingredients which are good for hair, muscles and skin. Massaging skin using this oil promotes blood circulation, de-stress and improves the sense of well being, reduces stiffness and muscular pain, rejuvenates and tones the body. This oil can as well be used for massaging legs, face, hands and whole body. Benefits of Champi Champion Tailam The process of Champi Champion Tailam is made effective by using a unique process called Taila Pak Vidhi Delays premature ageing of body THROUGH TOTAL REJUVENATION Reduces pain and stiffness by promoting circulation of blood Gives instant energy on account of toning whole body Improves muscle suppleness and strength Can be used for Hair, Face and Body with all round benefits Promotes better sleep for days after the process It is for full body application but equally effective for scalp and hair Will deliver results even with moderate pressure Reduces Hair Fall and delays premature ageing Important Note For external use only; if you have swallowed a large quantity, please try to vomit and throw out from system. Avoid contact with eyes. It is important to take a bath within 30-60 minutes of application of Champi Champion Tailam.